Rogue One brought in quite a few new characters to the Star Wars lore. Whether that’d be Cassian Andor, Chirrut Imwe and sidekick Baze Malbus, as well as the lead character Jyn Erso, Rogue One packed in some memorable characters . 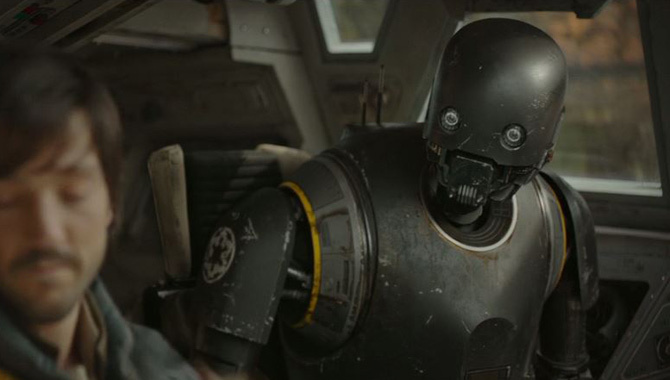 The character that everyone seems to be talking about is the sassy droid K-2SO (played by Alan Tudyk). Often compared to HK-47 from Knights of the Old Republic, K-2SO is a reprogrammed Imperial security droid who follows the orders of Captain Cassian Andor. This droid brought some much needed humor to a rather serious and more war-toned Star Wars film. When the film needed a laugh or two, K-2SO delivered. As one of the heroes of the Rebellion, lets take a look at the ten best quotes stated by K-2SO. After Director Orson Krennic orders the Death Stars weapon to fire onto the capital city of Jedha, K-2SO acts fast and prepares the U-Wing to pick up the crew. 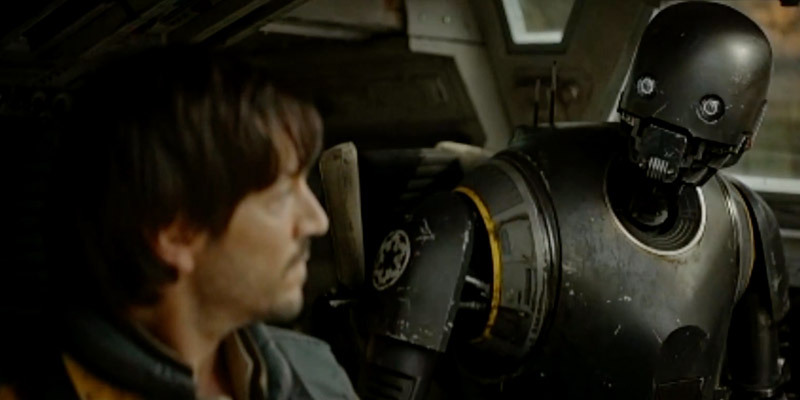 As the ship is taking off, K-2SO quips this line of dialogue informing Cassian that he can no longer see the Sun due to the massive destructive cloud that’s headed their way. It’s a little humor in a desperate moment that makes this line stand out. 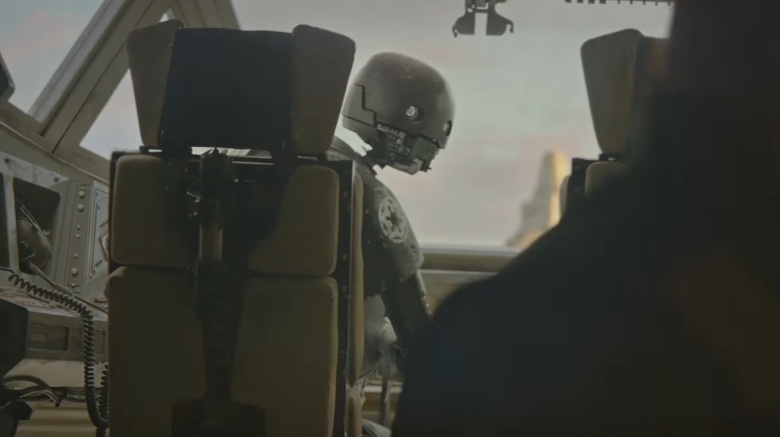 When K-2SO was asked to stay behind with the ship, audiences knew that this wouldn’t be the case. This humorous line of dialogue is spoken after a Stormtrooper tosses K-2SO a hand grenade that’s about to go off. Kay casually throws this grenade at oncoming Stormtroopers. The line is directed towards Cassian and Jyn because he knows deep down that they did need his help to escape. Thankfully, he was there to protect them. Fans that had seen this clip released prior to the film were slightly spoiled. This hilarious quote was spoken after Jyn’s encounter with a couple of Stormtroopers on Jedha. Jyn is seen shooting her blaster at many Stormtroopers including an Imperial security droid. Unknowingly, Jyn shoots a droid right in the chest. Fortunately, this security droid wasn’t K-2SO and therefore walks away unharmed. 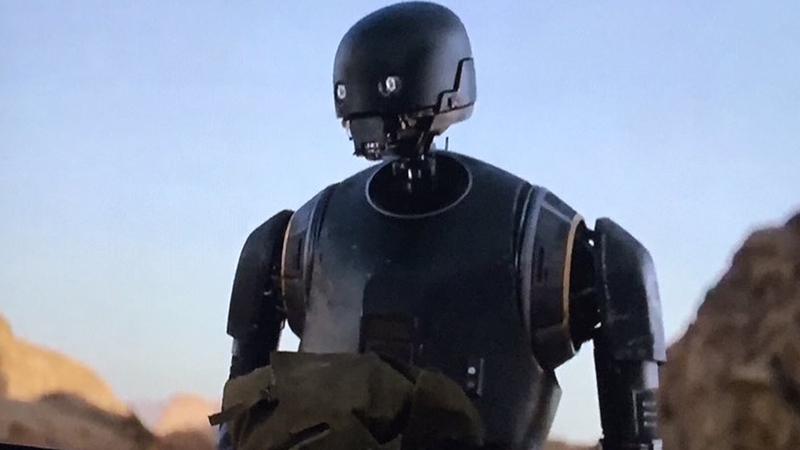 You can’t get a line from K-2SO that’s more arrogant than this one. This line is said as the team is ready to land on the planet Scarif. Jokingly, Kay makes it known to the crew that if something were to happen to this Imperial cargo ship that they’re in while in space, he would no doubt survive. While this may be true, this line couldn’t have come at a worst time while all of the other crew members are scared to death at the oncoming mission they are about to take part in. This is the first line of dialogue spoken by K-2SO and it’s a doozy. This moment takes place when the Rebels are rescuing Jyn Erso from what looks to be an original Clone Turbo Tank. The quote couldn’t be more perfect as the line of introduction to this character. The sarcasm in his voice says it all and sets the stage for a character audiences are going to love. You knew this line was going to be somewhere in the film and it didn’t surprise me at all that Kay is the one who says it. It also doesn’t come as a shock that this line isn’t even finished as Cassian and Jyn cut him off so he doesn’t blow their cover. Since Rogue One isn’t part of the episodic films, it made sense to have him not finish the line since these standalone movies want to be different. This quote is stated after Jyn tells Cassian that she had just found the blaster lying about. K-2SO is already agitated that he himself isn’t allowed to wield a blaster so it isn’t shocking in the least that he calls Jyn out on this. This is yet another great line spoken by Kay. One of the longest lines for Kay in this film comes quickly after said previous line of dialogue. Right before taking off to head to Jedha, K-2SO informs Cassian that it wasn’t a smart idea allowing Jyn to carry a blaster without someone watching her. Kay believes that the odds are high that she could easily turn against them to try and escape. This line again shows the protective nature of this droid. This is the last line spoken by K-2SO directly towards Jyn Erso before Kay locks both Cassian and Jyn safely where they can retrieve the data. It’s a touching moment because Jyn knowing Kay has been asking for a blaster, gives him one to use as protection against any threats exclaiming “You wanted one right?” Though they bickered back and forth throughout the film, Jyn shows that she does care and counts on Kay to accomplish this mission. It’s safe to say that without Kay’s help, they would not have succeeded on retrieving the plans to the Death Star. So what could possibly be better than all of these quotes? Read on to find out! Right when you thought K-2SO has a change of heart and wants to fight for Jyn, he ends with “Cassian said I had to.” In other words, Kay isn’t going on this mission on his own merits, but is merely following orders. Though Kay goes on this mission, audiences know it’s not out of the goodness of his heart. 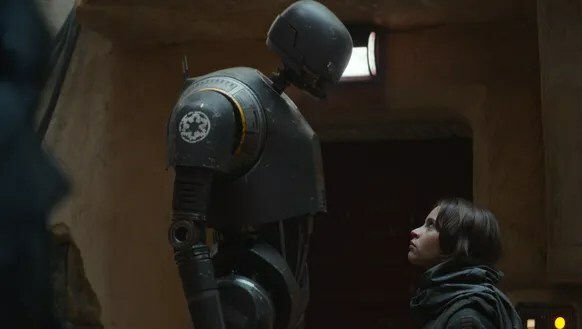 What were some of your favorite quotes from K-2SO? Share your thoughts in the comment section below!